First off let me say that I read other people’s newsletters and books about getting better shots at the zoo, so when I needed to shoot some test shots with my new 70-200mm zoom lens, it was an easy pick to do the zoo. Plus I knew that I would be going near the zoo on some other business. 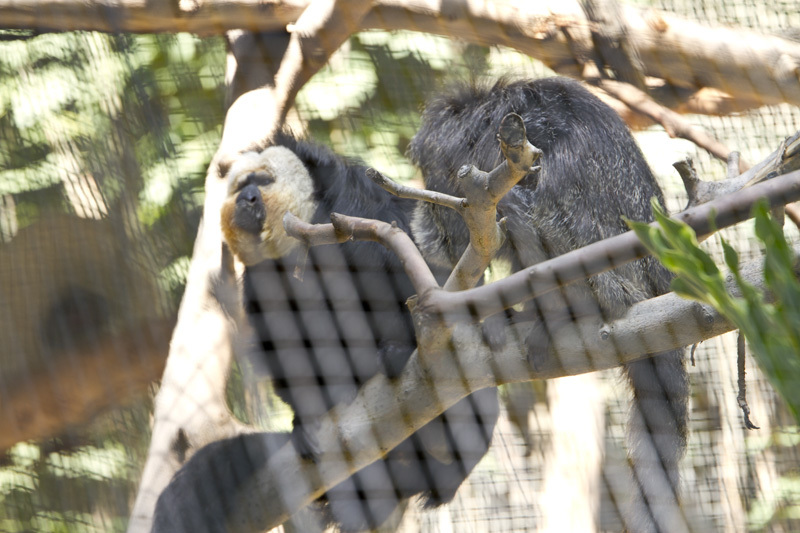 So I spent an afternoon at the Los Angeles Zoo, couple of hours really. I had my new Tamron SP 70-200mm F/2.8 Di VC USD lens. I also had my Canon 100mm F2.8 and 2 Canon 7D bodies to mount them on. I also had a dual sling on, trying it out for the prospects of using it for weddings and other places where I would need to carry 2 cameras. The sling was made by Cowboy Studios. I bought it off Amazon.com for about $22. My brother and I modified it with different sliders that we thought were better by BosStrap. I tested that the sling worked without binding or slipping all over the place and was comfortable to wear. It passed the test. I even wore a photographer’s vest and backpack over it to see if it would work under a jacket. It wasn’t too bulky under the vest and no comfort issues with the backpack. The BosStrap connects to the camera’s strap connector instead of the tripod mount that the Cowboy Studio design connected at. My single sling connects at the tripod connector too and I have to watch to make sure it doesn’t loosen up during the day as I walk around. The BosStrap connector is a quick connect fitting on the camera so you can take it off the sling fast if needed. Taking the connector off the camera is another thing, slow. Put it on and leave it there. Small enough to not matter or get in the way when not in use. 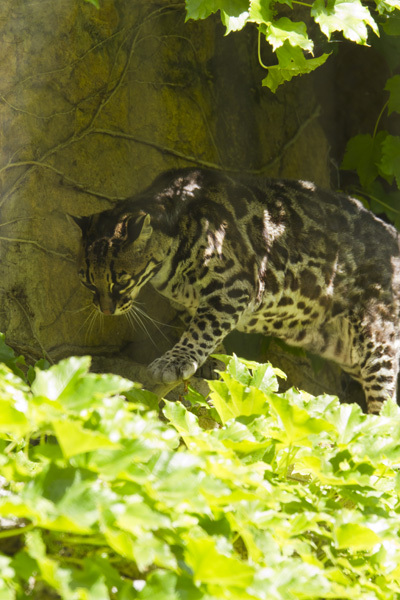 I shot photos with both cameras and tried to compare the images, however most of the better shots were with the 70-200mm because of the issue of getting closer to the animals. 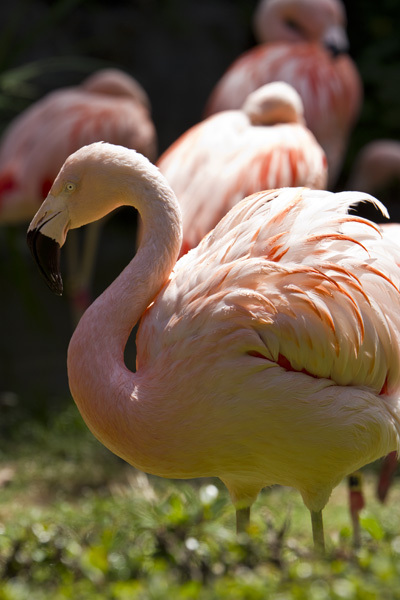 Both lenses were on manual focus as the auto focus kept on trying to focus on the cages instead of the animals. 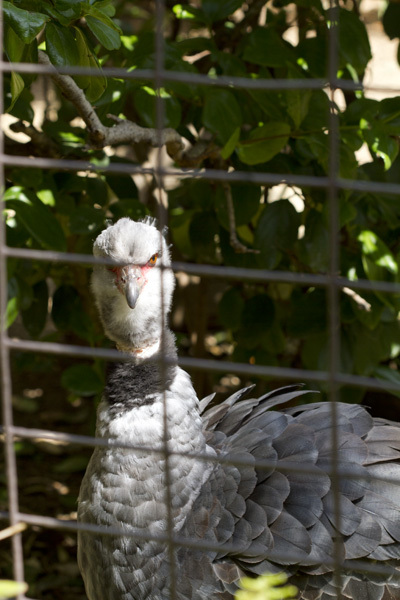 Every time I pressed the shutter button it re-focused, back and forth between animal and cage. I’m not practiced at manual focus so moving animals were a problem. The 100mm focused faster, less of a twist to get the focus ring in and out. The 70-200mm had a long throw to the focus ring, twisting the focus ring a lot to regain focus if I zoomed in or out. Also when I had film cameras they had split lens focus so it was easier to see when the camera was in focus. Both cameras were on manual setting so I could control the f-stop and shutter speed. 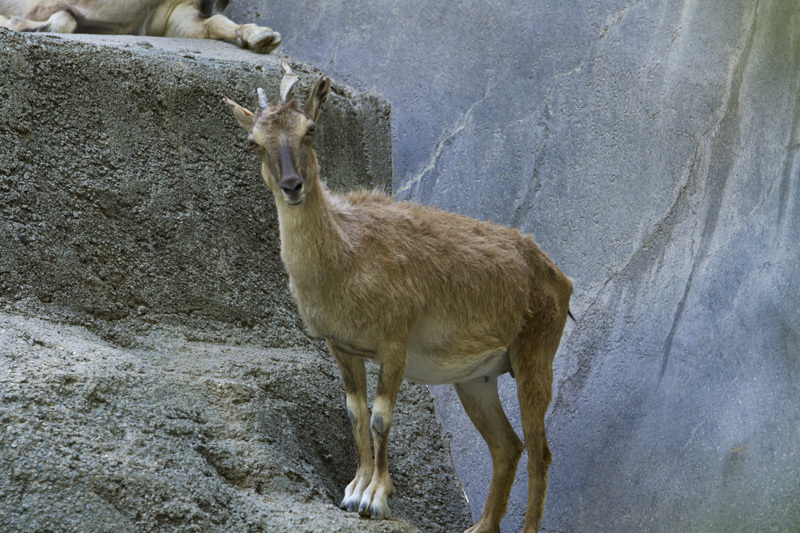 In photographing the animals at the zoo, it is hard to keep a natural look to the photos. 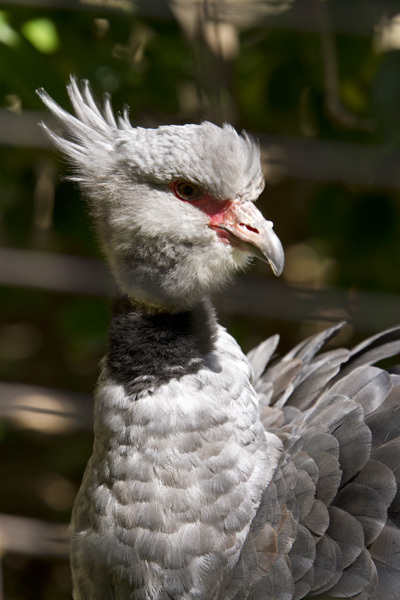 You want to get the cages out of the photos. Not as easy as it sounds, as some cages are plexiglass some are mesh nets and some are metal wire. Plus the pens the animals are kept in have a lot of man-made objects in them. But if you take your time and look carefully some of it can be avoided or minimized. 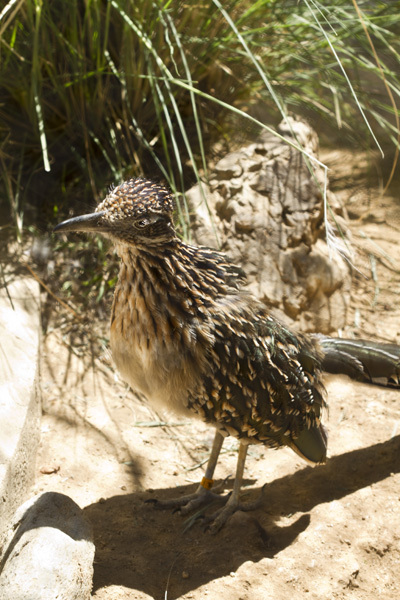 This first shot is of a roadrunner that came up to the glass and jumped at a little kid staring in from the other side. I shot this with the 100mm and was close enough that it works well. The sun is behind the bird so there is no reflection on the glass and no glare either. A lucky angle as far as I’m concerned. There was a roof overhead which cut down on the glare on the glass and the glass was clean in that area. 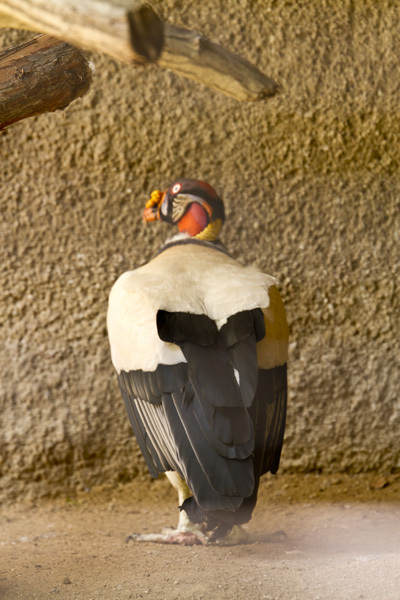 This next shot of another bird in a similar type of enclosure shows the possible errors and problems. You can see the glare on the bottom of the glass enclosure and the glass is not very clean so it shows up. Also I did zoom in on the bird but it was at the far side of the cage. Also had I thought about it I could have used a circular polarizer filter to reduce the glare. I think I had one for each size lens, as I have other lenses with the same size filter mounts. I have several backpacks that I use for my camera equipment, one is a camera pack that protects the gear, one is a hydration backpack that is better for hiking and long walking photo shoots and another is just flash equipment and extra stuff. So I don’t always remember what I brought with me each time. I have to remember to get the right backpack together the night before and I keep batteries and memory cards in each of the main packs so I never without them. But filters get mixed up between the backpacks. Yes, my hobby is getting the better of me as I prepare to go into the business photography. This next shot is again showing the problems with shots taken around cages. Now here is another shot of the same bird with a different lens and setting. Notice how the wire has blurred out and is not as noticeable. It makes for a better shot. Here is another shot where I was shooting though plexiglass but I moved around and found an angle where the glare doesn’t show up much. Just a little in the upper left corner and it just looks like lighter rock. The cat was nice enough to move over to the other side of the pen to let me get this shot. Makes it look like it is out in the wild somewhere. 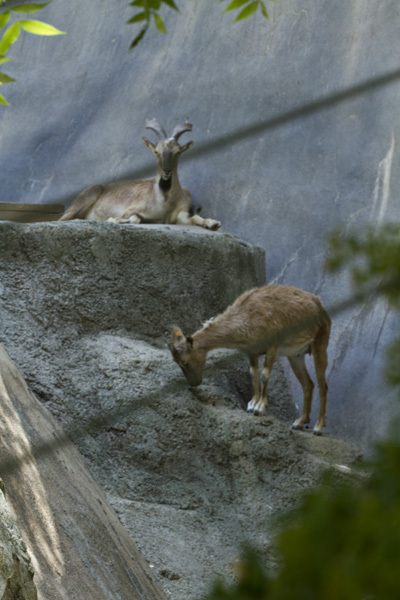 Some of the animals are just in enclosures that you can look over the tops of and shoot into the cage, the animals don’t jump or climb so they are not a problem to keep caged. 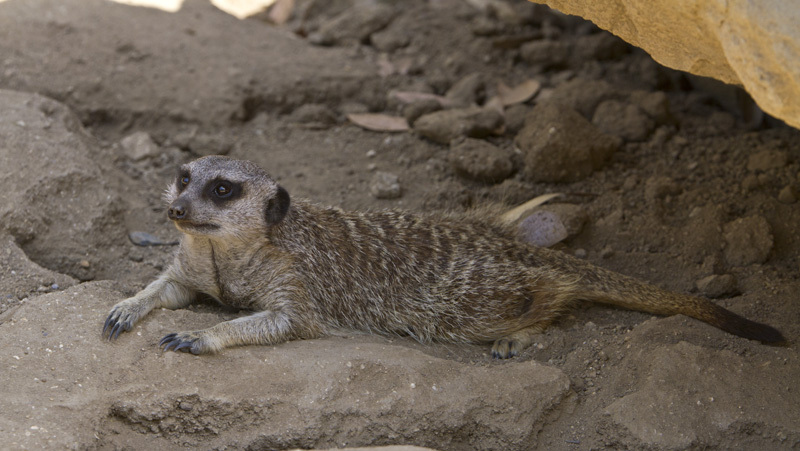 Then it is just a matter of finding an angle that makes it look natural, like this meerkat. This meerkat was nice enough to move into the shade, I thought it was going under a rock but it came out the other side and laid down. 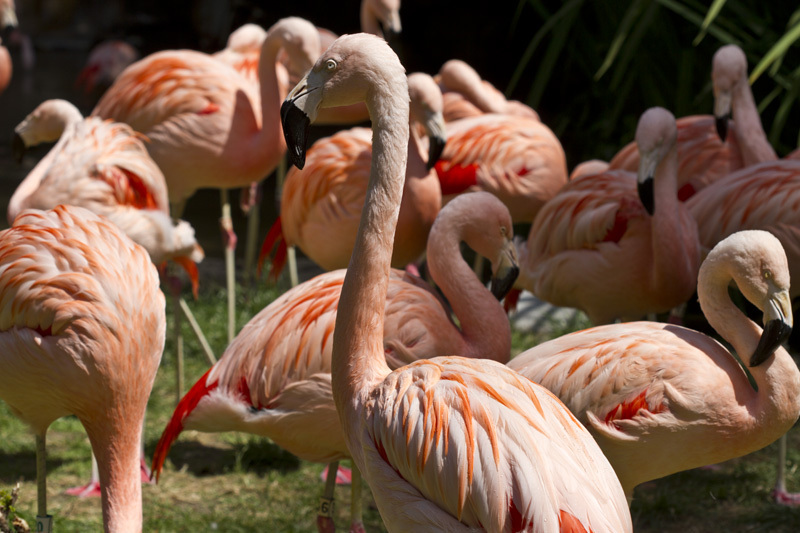 Here are some shots of flamingos where tight crop and shallow depth of field hide the fences on the other side. I like the water highlights on the back of this first one. Shot with the 100mm lens. Of course, some animals just are no help at all. 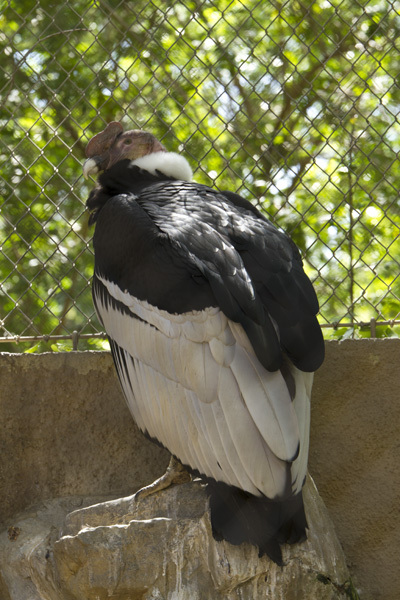 Here a large condor bird is up against the wall, back to the camera and rarely turning it’s head to where you could see it. I had to focus on the back and wait for it to turn it’s head so I could get the shot. The front cage wire is blurred out but the back fence is very plain to see. And here some white faced monkeys sat on a branch where the mesh in front was just far away from the camera enough to still be in the focus plane but fuzzy. Light was hitting on the mesh too making it show up more. Not much to do other than come back later and try again, or earlier in the day would have been better too. 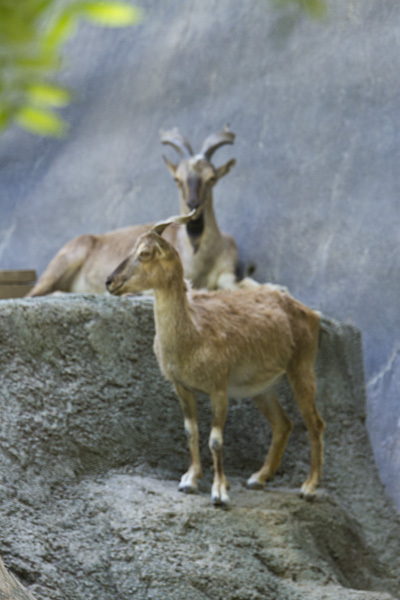 In these next few shots I shot some photos of some mountains goats, the first photos is slightly out of focus but in the next shot I show what I was shooting though. The last shot is a good focus on one goat. And the good close up. 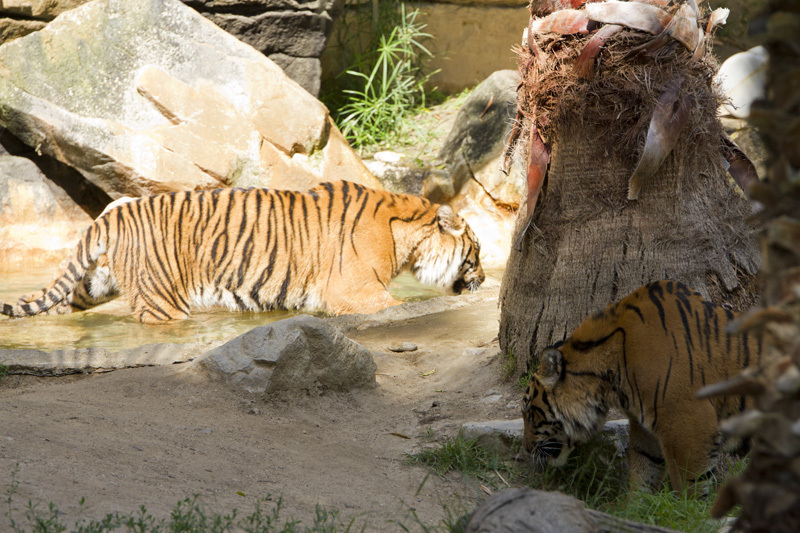 These tiger were moving in and out of the shade making it hard to get nice shot but after shooting several shots the one tiger came around and stopped in front of the pond. It made a nice semi natural shot. 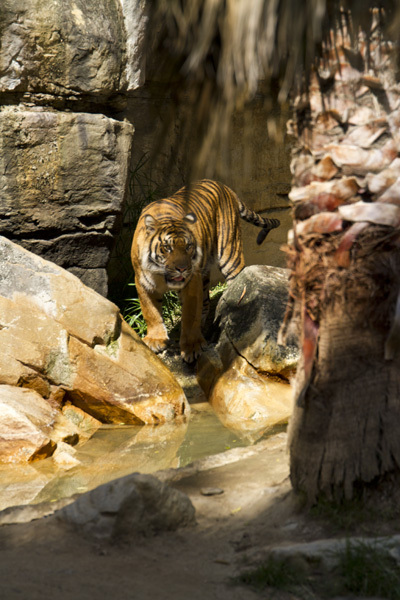 this next shot took some Photoshop and Camera RAW work to pull it out, one tiger in shade and one in the bright sun. But I got the shot and it works. 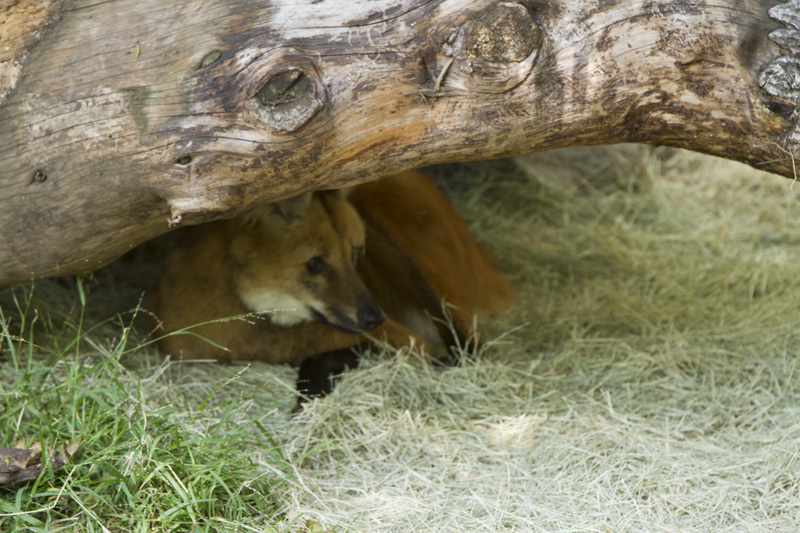 This red wolf wasn’t moving around but it’s placement under the log gave it a natural look too. 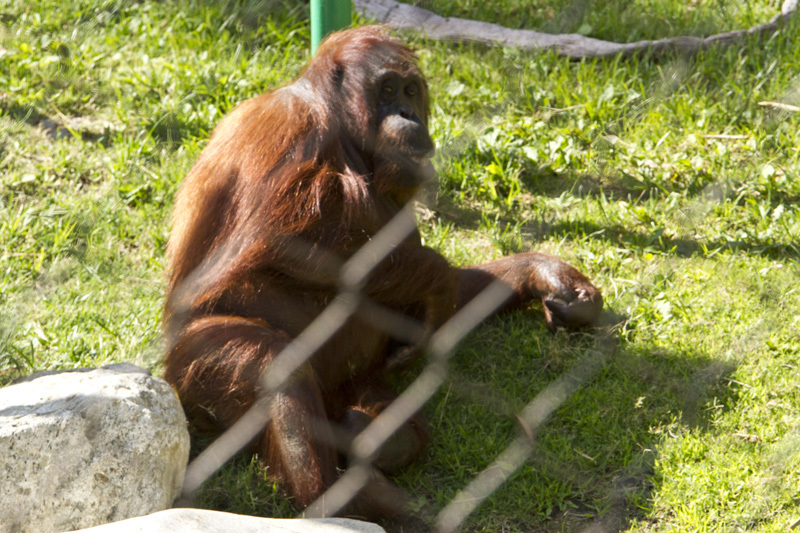 However this shot of a orangutan shows the wire mesh in front of it again. The sun is lighting up some of it and it is far enough away from me that it doesn’t blur out. It is about half way between the orangutan and me. I was on a platform looking down into the pen and the fence was 10 feet or so away from me. I also had closed up my f-stop some due to the bright light. If I had opened it up some it would have blurred the cage better. 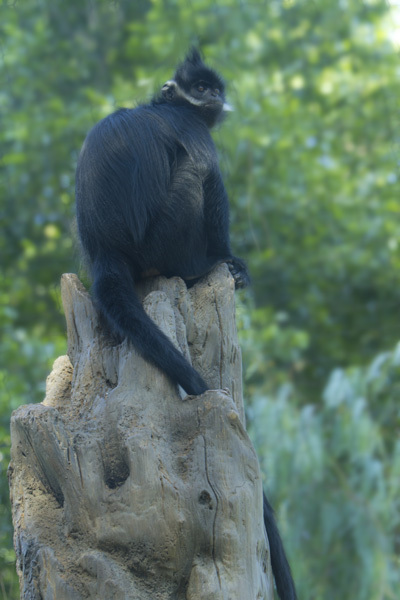 This next shot I was shooting though plexiglass, no glare on it but there is a mesh fence behind the monkey. And yes it has a very long tail, you can see it winding down the fake tree and out of the frame at the bottom. I just had to use Photoshop to blur the background since it was an easy to do job. Now it looks like the monkey is in the forest. 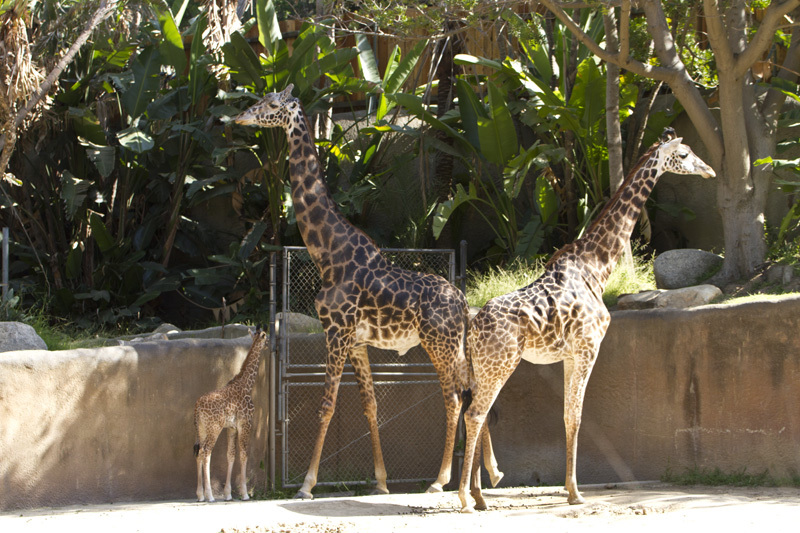 Last is a couple of shots of giraffes, they didn’t cooperate too much. They were grouped by a fence. 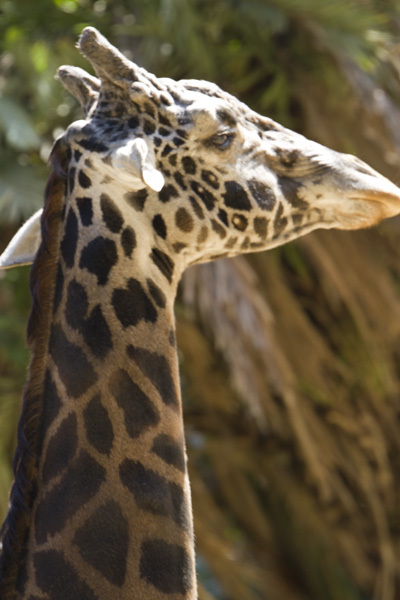 But then the one giraffe came over and I got a head shot. The background blurs out making it somewhat better. Well, there is my trip to the Los Angeles Zoo. 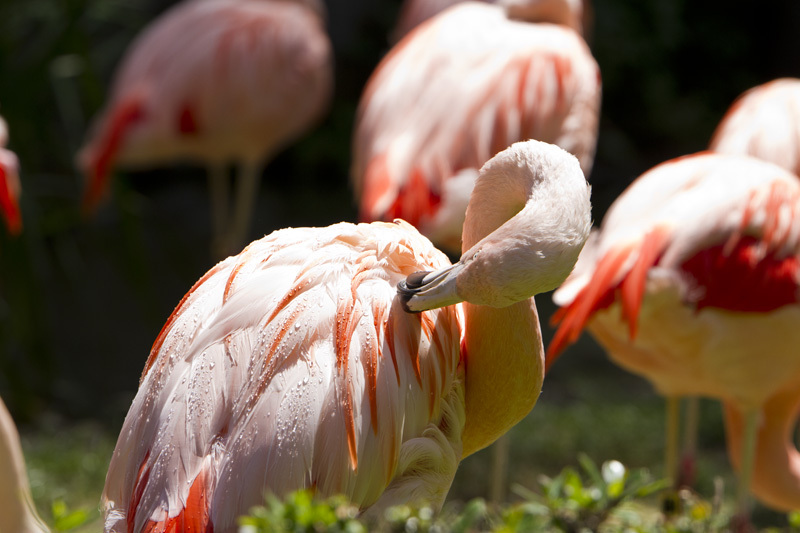 I hope my shots give you some insights into how to shot better shots at a zoo near you. Hopefully the animals will be more cooperative for your shots and if you go early enough in the day so that you get some shots without the sun on the fencing or can come back to get the shots later in the day to get the shots.